The position after move 11 is in the middle of a small skirmish in the corner. White is not strong at joseki, so the moves that follow are just what common sense indicates. White 1 is a Hane at the Head of Two Stones stones. Black replies with 1 taking the corner. 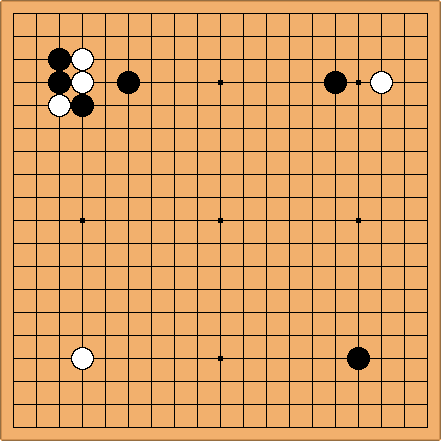 White connected, defending a stone and putting some pressure on the black group. Black has no choice but to play atari from below; and White pulls the stone out. Black 6 gives the group in the corner good chances to live. White pulls out again with 7, and Black prevents the cutting stone from being captured in geta. Now White feels that the group at the top is in danger and runs away with 9. Black tries to cut with 10. This, probably, was a mistake but White's bad play made it a success.